This is the 100th issue of the Life of Labour newsletter! To commemorate this special edition, we thought we would focus on labour media. Life of Labour is essentially a round-up of the week’s labour news and it depends entirely on other people doing the hard work of reporting and documenting the events of the week. So we wanted to dedicate an issue to all the media organisations in India and outside who dedicate time and resources to reporting and publishing news about work, workers and the working class. Why is reporting on the working class important? P. Sainath once said, “When you don’t have an agriculture or a labour correspondent, you are basically saying that 75% of the population does not matter.” Mainstream media are geared far better towards covering Delhi and the jostling of far-away powers than they are on covering unemployment or the agricultural crisis. Papers like the Times of India do an excellent job of recording that events took place (most of our stories of accidents at workplaces are links to the ToI) but they stop there. They cover the drama of the explosion but not the struggle of the humans affected by it. In September 2016, when the entire country, more than a million people, went on a national strike, a large section of mainstream media felt their primary job was to explain to readers whether the bus system would be affected or not. This newsletter comes directly out of that realisation. It’s an attempt to signal boost labour news and to create a small space for it that makes the working lives of people its primary focus. As said before, while we do heavily rely on mainstream media, a large section of our news comes from outlets and social media pages, run with volunteer effort, minimal financial support and no corporate funding. These spaces are a testament to the power of collective effort. Their efforts at sourcing news, and the insights and perspective they have offered, have informed our newsletter week after week, allowing us to do more than the basic collection of “this happened” stories. People’s Archive of Rural India, or PARI, is described on its website as a journal and an archive, publishing multimedia reporting as well as acting as a database of existing journalism on rural India. It is a record of rural Indians’ lives and labour through their own words. The project runs on donations. PARI’s recent coverage of the Kisan Mukti March is highly recommended reading. GroundXero is a new initiative that explicitly seeks to rebalance the propagation and dissemination of news in favour of working people, rather than corporate entities. Through a wide network of active citizens, GroundXero sources news on topics of serious public interest, while also shining the spotlight on events and issues that mainstream media fails to cover. It is a great source of news about workers’ struggles across North and East India. It is published in English and Bengali. Labour News – India, which is completing its fifth year this month, is a Facebook page with over 29,000 subscribers. On a daily basis, the site admins seek out news related to workers from mainstream as well as alternative news sites and share it with their subscribers who are predominantly factory workers and union activists from across India. The page acts as a news aggregator on issues of labour. NewsClick describes itself as an online alternative to corporate news media, offering critical analyses on India’s current affairs as articles and videos. Centre for Workers’ Management is a non-profit organisation set up in 1991, to help workers’ organisations with research, training and campaign support. They are a good source for the latest legal and policy related decisions concerning workers and the workplace, news on workers’ struggles, and they also publish analyses and explainers on important issues. They regularly publish Workers’ Connect, an online journal. Labourstart is an international online news aggregator, with the tagline “Where trade unionists start their day on the net”. It’s run through volunteer correspondents from across the world. It shares links to news on workers and worker related developments published in over 20 languages, while also running online campaigns of various trade unions and international federations of workers’ organisations. It has been providing this service for over two decades and currently reaches nearly 1.5 lakh subscribers. China Labour Bulletin, based out of Hong Kong, is a news and resource site for Chinese workers. Operating outside of the Communist party-affiliated All China Federation of Trade Unions, it is a good source for information on Chinese workers and significant events within Chinese labour movements. With the stated aim of democratising ACFTU, it has been operating for more than two decades, first as a printed newsletter and later as a website. 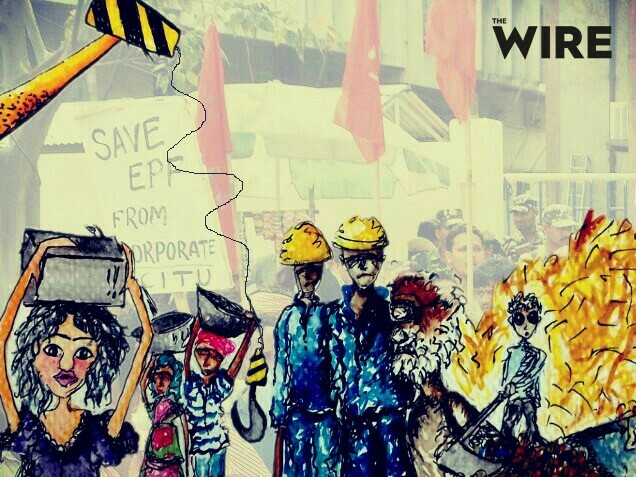 Australia Asia Workers Links (AAWL) is a solidarity platform which focuses on workers’ rights and struggles in the Asia Pacific region, while also writing and documenting struggles internationally. They publish Mini News, a newsletter collecting worker related news from around the world. There are a handful of American magazines that write entertainingly and articulately about labour politics. Dissent is a quarterly online and print magazine “of politics and ideas” from the democratic left. They produce Belabored, a podcast about labour hosted by Sarah Jaffe and Michelle Chen. Dissent’s latest magazine issue is on the right to housing. Jacobin is another online and print magazine which publishes perspectives and analyses from the American left. One of the best-written Left-wing magazines in the US, The Baffler has been publishing steadily for the last few years. They offer the political analysis and cultural criticism that “blunts the cutting edge” of whatever the US is talking about at the current moment. Current Affairs is another completely reader-funded magazine that combines insightful analysis of American current affairs and left policy debates with wit and humour. They also have a fun podcast. The last one on the list is, surprisingly, Teen Vogue. Ever since a change of editor in 2016, Teen Vogue has become an outlet that mixes feminist and labour politics in an accessible manner. For example, here’s an explainer titled ‘What a Labor Union Is and How It Works‘. Note: From next week, Life of Labour will be delivered on Fridays at 10 am.